Stunning apartment on the 32nd floor of the La Perla condominium in North Miami Beach, Sunny Isles on the beachside with beautiful, beachfront, oceanfront, ultra modern, with 3 balconies over looking the beach. Completely furnished, king size bed in master bedroom, queen size in second bedroom, queen in the den, plasma TV, internet, marble floors, granite counter tops, kitchen fully equipped, professionally decorated. There are large closets throughout, central air, as well as a washer/dryer combo. La Perla is a full-service condominium complete with a 24-hour doorman, children's play room, gym with an incredible ocean view, billiard table, library room, party room, open pool, jacuzzi, and topping it all off, a complimentary beach service providing tenants with lounge chairs and umbrellas to enjoy the best of the gorgeous Sunny Isles beach comfortably and in style.Exclusive parking space assigned to the unit. Just like Luxurious Paradise! Swimming, fishing, volleyball, surfing, para sailing and jet ski rental available. 2 minutes to Oleta River State Park, 9 Miles North of South Beach. My name is Irina. I live in New York with my Family. My Family immigrated from Minsk, Belorussia 28 years ago. I speak Russian. In 2006 I bought my favorite place in the world-Miami condo, I decorated it for myself, my Family and friends first, and now I am not able to use it as often as before and decided to share it with my guests. But I am coming back very often, when it is available. Oceanfront, Oceanview, Incredble relaxing environment, Literally two steps and you can feel the sand on your toes. Fishing pier with restaurant & sports bar directly on the beach. Heated pool and Jacuzzi directly on the beach, Gym overlooking the beach and the ocean, 24 hr security, valet parking, and concierge service. Close to Aventura Mall, Bal Harbor, 15 minutes from South Beach, near Turnberry Golf and Country Club and Gulfstream Casino and racetrack, excellent restaurants and commercial centers. Great location! Starbucks, grocery store, pharmacy all 5 minutes walk. View over the ocean is amazing. Beach and towel service are nice. Condo staff was always very helpful. Apartment itself is okay. Amazing apartment with beautiful views!!! This is our 2nd stay in this place! The apartment is beautiful, bright, and airy. Felt like we were in a our second home! The apartment was very clean and neat. Comfortable, separated bedrooms with closets and balconies, large living room. All windows with unbelievable, absolutely stunning Ocean view. You can see the sunrise and sunset ! There is nothing like waking up to the sound and view of the bright blue ocean. The building itself is also impeccable, clean, spacious, smells great, 2 TVs, connection to the Internet. The pool area is large and luxurious, with beds, as well as tables and private cabanas. Perfect place for couples, singles, or families with kids. Irina is a great host and we look forward to renting from her again! Thanks, see you again ! Great location on the beach with a restaurant/bar located on the pier steps away. Very nice building and all of the employees there were very nice and accomodating. It is right on teh beach and all 3 balconies have a view of the ocean. Great restaurants, shopping, Starbucks, etc. all in walking distance. I highly recommend the apartment. I am happy Enrico, that you enjoyed my place and I am looking forward to host you again . Amazing apartment and location ! We rented this apartment for a family vacation in August, 2018. The building is centrally located in the Sunny Isles - easy access to shopping and highways. The apartment features high-end finishes throughout, including marble floors, with top-of-the-line appliances, perfect layout - 3 totally separated bedrooms with a private bathrooms and balconies. There are large closets throughout, central air, as well as a washer/dryer combo. Very bright, modern, nicely furnished and well kept apartment. La Perla is a full-service condominium complete with a 24-hour doorman, children's play room, gym with an incredible ocean view, billiard table, library room, party room, open pool, jacuzzi, and topping it all off, a complimentary beach service providing tenants with lounge chairs and umbrellas to enjoy the best of the gorgeous Sunny Isles beach comfortably and in style. The communication with the owner was very easy and informative. Thank you Irina, it was a pleasure to stay at your place ! Thank you Irena for staying with us . 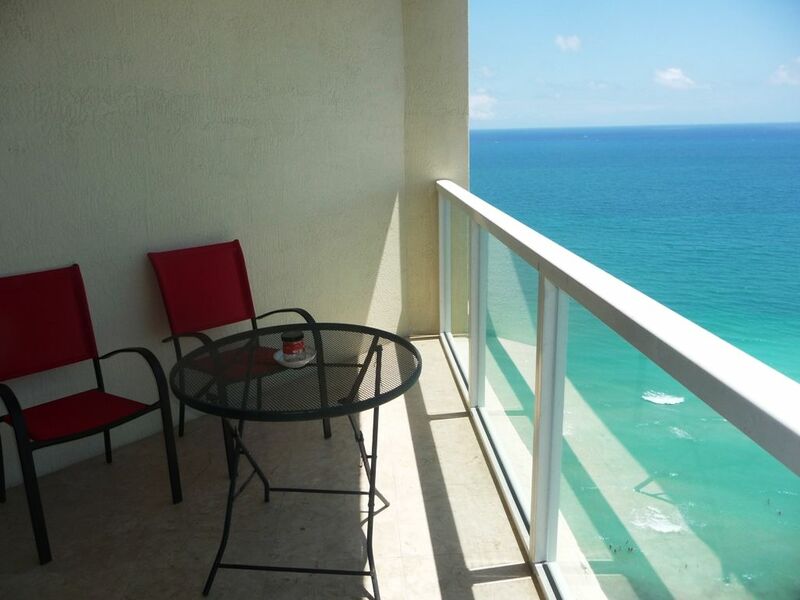 We are so happy that you enjoyed the building's location and amenities, the apartment and its views, and Sunny Isles. Apartment is very clean, ideally located and the owner attention was much appropriated. Very comfortable beds and excellent amenities. Highly recommend. Thanks, always welcome back ! My husband and I stayed in this apartment with two other family members from March 17 to March 29, 2018. We had a wonderful time. This apartment was very comfortable. The layout was perfect, and the kitchen was very well stocked. The best part of our stay, of course, was the spectacular view from the balconies. We loved the valet parking and the beach services. The staff members at La Perla were very helpful, and the facilities were very secure. Irina, who owns this apartment, was easy to work with. She answered my questions immediately when I contacted her. The location of this property is close to the grocery store and wonderful restaurants. I would highly recommend this vacation rental. Thank you for wonderful review. You will enjoy property amenities: gym, billiard table/ room , kids' play room, heated pool, jacuzzi, party room. $20 per ADULT - RESIDENT IDENTIFICATION CARDS paid to the management office. $10 - PARKING DECAL FOR YOUR VEHICLE DURING YOUR STAY paid to the management office . Credit card fees 3% will be added as an additional payment if paid by Credit card. For international transaction additional 2% will be added as an additional payment if paid by Credit Card issued by any other country then USA.